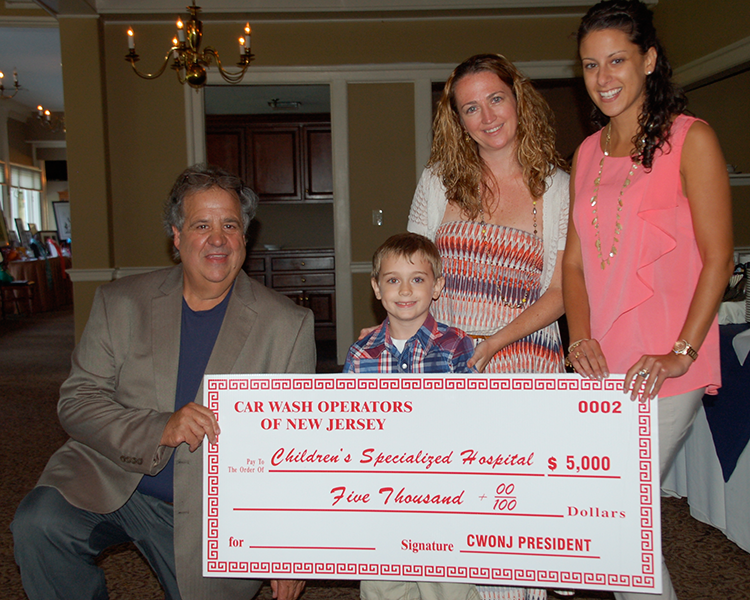 CWONJ raises $5,000 at Children’s Specialized Hospital 14th Annual Golf Outing in Union. UNION, NJ — The Car Wash Operators of New Jersey (CWONJ) played some great golf and raised $5,000 for the Children’s Specialized Hospital here on Monday, August 4. To date, the CWONJ has raised $47,000 for the hospital. In addition to 18 holes of golf on the Gary Player signature course, the group enjoyed a buffet lunch and dinner, as well as a lively cocktail hour complete with passed hors d’oeuvres, before taking part in the silent auction facilitated by RSI. Proceeds from the auction are given back to the hospital. The winning foursome consisted of Scott Freund, Chris and Barry Hart and Pete Defazio with a 57. Second place went to Jay Birnbaum, Jeff and Steve Liebhoff and Dom Sinisi with a 59. The winning foursome took home $100 gift certificates from the pro shop and the runner’s up got $75 gift certificates. Men’s longest drive winner was Jay Birnbaum and women’s longest drive went to Trista Ricciardelli. Bill Leary had the closest to the pin on hole #11 with 11’9” and Chris Coleman had the closest to the pin on hole #16 with 1’5”. Each winner received an $85 pro shop gift certificate. The association would like to acknowledge its vendor sponsors including: Platinum Sponsor/Buffet Reception Sponsors, ICS and ZEP Inc.; Lunch Sponsor Simoniz USA; Lunch Beverage Sponsors Old Granddad and Unity Bank; Hole-In-One Vehicle Sponsor Ray Catena Auto Group; Hole in One Sponsor Birchwood Insurance; Sponsor the Pro Sponsors Jobe and Peco Car Wash Systems; Beverage Cart Sponsor Prime Lube; Golf Cart Sponsor Carwash Insurance Program by McNeil & Co., Inc.; Towel Sponsor ERC Wiping; Closest to the Pin Sponsor Rosey’s Tank Cleaning; Men’s Longest Drive Sponsor Stoner Inc.; Cocktail Hour Sponsors Circle Lubricants, Inc. and Micrologic and RSI/Children’s Specialized Auction Sponsor Sonny’s Enterprises, Inc.
Hole Sponsors included: Broad Street Car Wash; Crystal Care; DRB Systems Inc.; ERC Wiping Products; Erie Brush; Doug Rieck/Magic Wash in Memory of Carolyn Coates; ICS; Kirikian Industries, Inc.; Kleen-Rite Corp.; Lorco; Madison Car Wash & Detail Center; Marlton Classic Car Wash; Frank Millman Distributors; Motor City Wash Works; Northeast Carwasher magazine; NJ American Water Company; PayMedia; Posh Car Wash; Qual Chem LLC; Rain Tunnel/Mike Conte & Family; R & T Electric; Rendemonti Wealth Strategies; Tameric Equipment; Transactiv; Tri State; UBS Financial; Val Pak of Central NJ; Washtech. The association’s next meeting, a carwash tour of Central New Jersey washes, is slated for October 22 departing from the Holiday Inn in Clark. For more information visit www.cwonj.com.